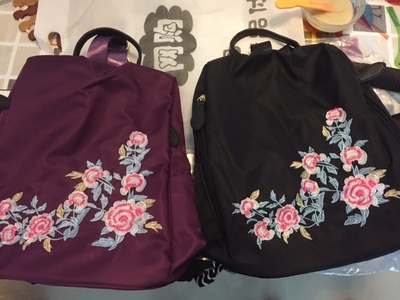 The embroidery is great.I carry these bag to work and holds everything I need with room to spare (vest, badge, phone, vape, pop, protein bar, several lip glosses/bobby pins/hair tie, etc). Plenty of compartments on the inside to keep everything organized. I purchased this backpack for a recent trip to an amusement park and waterpark with my husband and 4-year old. I had been looking for a cute backpack that wasn't too large but not too small. I am very satisfied with this purchase. Love, love, love it! I love the size, the look and the quality is #1. 100% recommend- great for festivals.